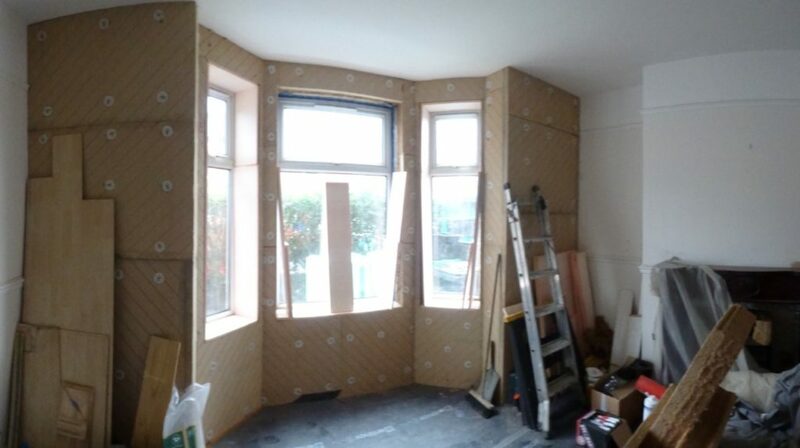 In 2012, DECC and AGMA commissioned Carbon Co-op to deliver a whole house retrofit project for owner occupiers testing elements of the government’s Green Deal. The project enabled householders to receive a free, whole house retrofit assessment, access zero percent interest loans, a design package from retrofit specialists URBED and contractors procured and managed by Carbon Co-op. A number of the ‘hard to treat’ homes also also received ECO (Energy Company Obligation) funding sourced by Carbon Co-op. The project demonstrated that by retrofitting the fabric of homes and installing low-carbon generation, in many cases with the occupants in-situ throughout, cuts of 40-60% or more can be made in domestic energy consumption and emissions. Gas use was very nearly halved, and for the majority of participants, PV panels generate approximately as much electricity as the household uses. The project came very close to achieving the ambitious target of cutting emissions to 17kgCO2/m2.a – representing the ~80% emissions cut from 1990 levels needed to reach the nation’s 2050 emissions targets. Of the 12 retrofits completed under this programme, nine were consolidated into a single contract, with Carbon Co-op as the client, managing the project on behalf of householder members. In the joint contract, householders spent between £20,000 and £60,000 each (average around £40,000) on the retrofit, PV panels and associated fees, depending on the size of the house and the number of basic energy efficiency measures already in place. Most of the houses in the project were older, traditionally-built properties with solid walls, so had not been able to take advantage of previous subsidised cavity wall insulation programmes. By looking at the whole dwelling and developing an integrated specification, the designers took care to ensure measures were not working against each other, or introducing problems elsewhere in the building. For example, purpose-provided ventilation was specified for all dwellings that did not already have it, to ensure that even after airtightness improvements, there would be a good supply of fresh air. The project succeeded in its main aims. There was an average of 47% reduction in gas use and for the majority of the houses, the PV panels generate approximately as much electricity as the household uses. Before retrofit, households had energy bills ranging from around £500 to £2,000 a year. After retrofit, these fell decisively, with households saving from £200 (off an already small bill) up to £650 per year. Adding in the income from the Feed-in Tariff from solar generation, savings effectively rose to between £800 and £1,100 per year for these homes.